Taxes: Will a corporate tax cut raise incomes? President Trump is hoping to convince middle-class Americans “that tax cuts for big corporations will put more money in their pockets too,” said Jake Novak in CNBC.com. 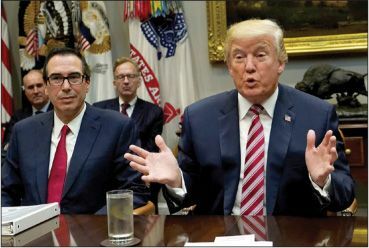 Republicans in Congress have made slashing the corporate tax rate from 35 percent to 20 percent a cornerstone of their tax reform push, and to bolster the case, Trump has become a “barnstorming campaigner for trickledown economics.” The White House Council of Economic Advisers released a study last week that projects the GOP’s proposed corporate tax cut will add between $4,000 to $9,000 a year to the typical household’s income, and boost GDP by 3 to 5 percent. These numbers are “inflated at best, and largely made up at worst,” said Doyle McManus in the Los Angeles Times. Republicans’ theory is that companies will use the proceeds of a tax cut to invest or expand, which will increase productivity—and that “will naturally result in higher incomes.” But as we’ve seen since the financial crisis, “it’s quite possible for corporations to earn record profits without wages growing at all.” Trump is also counting on companies bringing back hundreds of billions of dollars parked overseas to “dramatically increase demand for labor,” which would also drive up pay, said Tim Fernholz in Qz.com. But when the Bush administration offered a tax holiday on overseas profits in 2004, the top 15 repatriating companies brought home $150 billion— and passed most of it on to their shareholders. They then laid off a collective 21,000 workers over the next three years. The way America taxes corporations makes workers here “more vulnerable,” said Alex Hendrie in TheHill.com. That’s why we need to get more in line with how the rest of the world taxes businesses. When we last lowered the corporate tax rate under President Ronald Reagan, 35 percent was one of the lowest rates in the industrialized world. Since then, nearly every other developed country has slashed corporate rates—the average in Europe is 18 percent—while the U.S. hasn’t budged. The notion that high corporate taxes hurt workers has been an accepted fact for years by “policymakers on both sides of the political aisle,” said Casey Mulligan and Tomas Philipson in The Wall Street Journal. When President Obama proposed cutting corporate taxes in 2012, he said it would “create good jobs with good wages for middle-class folks.” So why the “turnabout” when President Trump proposes it?